Democrats Spinning Horrible Unemployment Numbers | Virginia Right! As the monthly unemployment numbers are released each month, it is astounding how the Democrats spin this downward economic spiral. The job losses began 6 months after the Democrats raised the minimum wage. Despite warnings from Republicans that this will lead to job losses, as Companies are unable to afford to pay higher wages, Democrats passed the bill. And the job losses followed. For the month of December, the Democrats were eagerly awaiting job numbers. After all, merchants hire Christmas help, right? Temporary jobs are fine when the Democrats count their own successes. Just imagine – finally creating jobs after a year of Obama in the White House – just in time for the State of the Union address. Just wondering what she will say next month when the rash of business closings hit. Many merchants were hoping against hope that the Christmas buying spree would put some much needed cash in their tills. A quick spin around several shopping centers shows that the only good news is for the sign makers. You know. The ones that make the “Going Out Of Business” banners. It is easy to see that the numbers for the next few quarters will continue to decline. Banks are reluctant to lend money, with no end in sight for the recession. The odds of another Depression are looming larger than the odds of any recovery. And one gets the feeling that the new definition of Recovery will be when the job losses finally bottom out, which might end up in triple digits if you take away government growth. 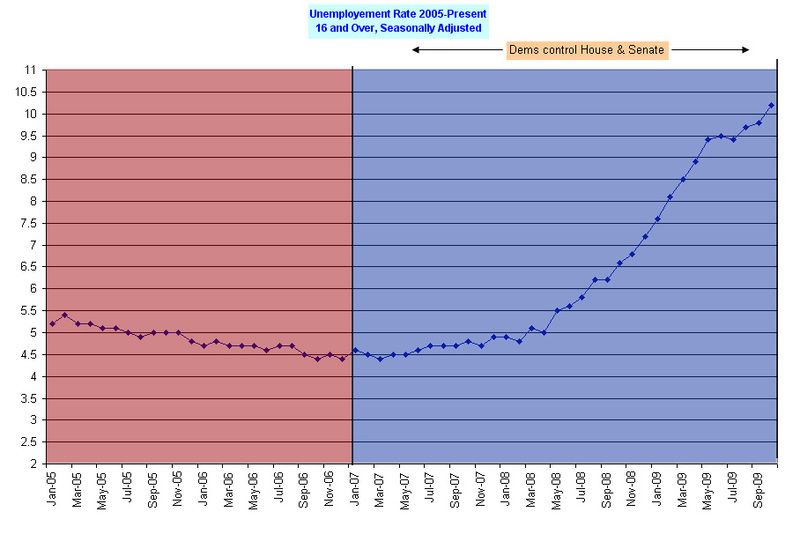 This graph can be found at Free Republic and tells a sorry tale of unemployment under a Democrat controlled HOuse and Senate. Bush’s fault? Yea, right. The Obama policies are making sure the economy will never recover the jobs lost, but at some point we will hit bottom. ANd that bottom will be the new reality as Socialist policies kill all growth and production. The Republicans released the following press release to remind us all of how bad Pelosi and Reid, et. al. saw the Bush jobs reports when millions of jobs were being created each year. Strange how they have changed their tune, right? After Attacking Bush During Periods Of Job Growth, And Pledging Their Stimulus Would Create Millions Of Jobs, Where’s The Dems’ Outrage?